This project will restore native bosque habitat along the Rio Grande in the northern portion of the Pueblo of Sandia Indian Reservation. Invasive species -- salt cedar, Russian olive, Siberian elm and Tree of Heaven -- will be removed from 41 acres that were previously treated and 44 acres that have not been treated. This bosque habitat is home to hawks, owls, racoons, skunks, porcupines and other small mammals and visited by bear and mountain lion. 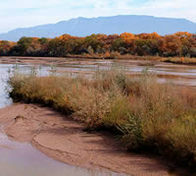 The Pueblo of Sandia has 9 river miles and 1000 acres of bosque that it manages for the benefit of native species. This project is sponsored by Coronado SWCD. It is funded through a USDA-NRCS Regional Conservation Partnership Program (RCPP) grant to Claunche-Pinto SWCD, our sister district. The grant provides funds for several projects of the Greater Rio Grande Watershed Alliance (GRGWA). Coronado SWCD is a member of GRGWA. The Alfredo Baca Riverside Riparian Treatment project is restoring nearly 26 acres of riparian habitat along the Rio Grande in Algodones. Non-native phreatophytes, such as Russian olive and salt cedar, are being removed. This helps restore native vegetation and riparian corridors to a more natural state, increasing ecosystem function. This project is an example of how conservation districts work together with private landowners to support their conservation needs. This project is funded through a USDA-NRCS Regional Conservation Partnership Program (RCPP) grant to Claunche-Pinto SWCD, our sister district. The grant provides funds for several projects of the Greater Rio Grande Watershed Alliance (GRGWA). Coronado SWCD is a member of GRGWA. The Regional Infrastructure Capital Improvement Plan For Placitas Acequia Reservoirs project was funded by a state legislative capital outlay of $75,000 to the District. This project will improve the integrity of holding ponds and related infrastructure of three acequias. All project funds received by Coronado are used for the benefit of Las Acequias de Placitas, Las Huertas Community Ditch, and Acequia La Rosa de Castilla. An engineering firm has inspected and measured the reservoirs, designed an improvement plan that meets NRCS specifications and prepared a construction cost estimate. The District sponsors several Chipper Day events each year. A chipping machine and operator are made available and residents can bring branches and small trees they have removed from their property to be chipped into mulch. Removing shrubs and trees near homes to create a "defensible perimeter" reduces wildfire risk to homes. Each Chipper Day is also a Firewise community education activity and fundraising event for the District. The Placitas Open Space is a 560-acre recreational area maintained by the City of Albuquerque's Open Space Division. It's rolling juniper-pinyon hills and Las Huertas Creek basin have been damaged over the years by pipeline construction, drought, and overgrazing by free-roaming horses. In 2015-2017, permaculture methods were applied to a 2-acre demonstration site to halt erosion and re-establish native flora. Volunteers were trained in permaculture methods, took part in work parties, and helped monitor the site's progress. See a description and photos of the permaculture methods used here. The project was funded by the NM Soil and Water Conservation Commission (SWCC). Coronado SWCD is working with the Middle Rio Grande Water Assembly, a non-profit organization, to revise the 2004 Middle Rio Grande Regional Water Plan. Learn more about the plan here. 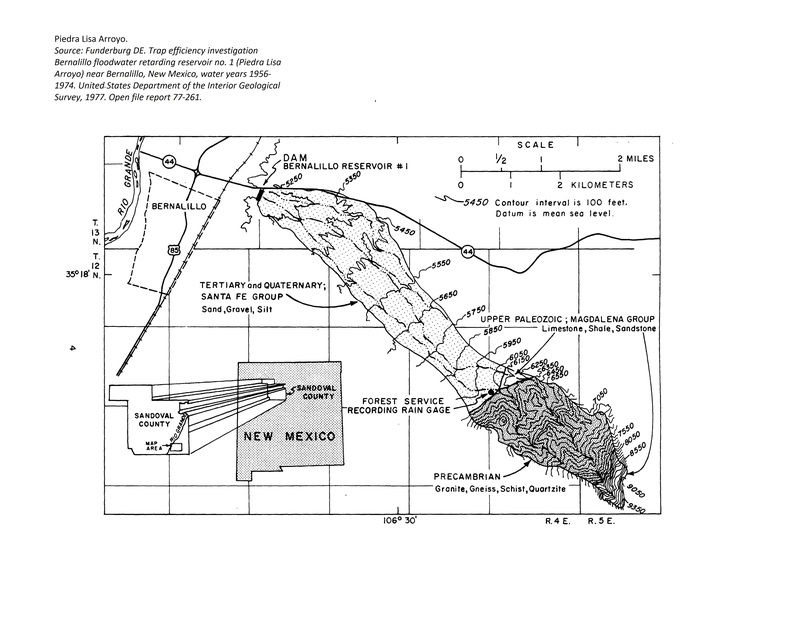 The Piedra Lisa Dam is located just southeast of the intersection of NM 165 and Interstate 25. This earth embankment "dry dam" was built in the late 1950's by the USDA Natural Resources Conservation Service (NRCS), which remains the engineer of record. Coronado SWCD, the Town of Bernalillo, and Sandoval County are co-sponsors of the dam and jointly responsible for its operation and maintenance under a 2007 agreement with NRCS. Protecting Bernalillo. The dam's reservoir is normally dry. During periods of intense rainfall, the dam holds back excess water in the reservoir to prevent downstream flooding. The dam underwent extensive restoration work in 2007. Among other improvements, the earthen auxiliary spillway was replaced with a concrete one and the top of the dam was raised about a foot. In April 2014, Roger Ford, the NRCS State Conservation Engineer who oversaw the rehabilitation work, stated that “the dam is currently one of the safest in the world.” The NRCS called the project, "an excellent example of how an existing structure can be brought up to modern-day standards through partnerships with local, state and federal governments..."
With the previous structural deficiencies now corrected, it is anticipated the dam will continue to provide flood protection for the next 100 years. What's in a name? Piedra lisa is Spanish for "smooth rock" or "slick rock", a feature of the canyons and arroyos of the Sandia Mountains far above the dam. Although some historical and recent documents spell the dam's name as Piedra Liza, the correct spelling is Piedra Lisa. The purpose of this project was to develop a forest restoration plan. The fuels condition of areas immediately adjacent to the Placitas community was evaluated. The areas are a mix of riparian habitat, piñon-juniper, and mixed conifer. They include approximately 200 acres of Cibola National Forest land in Las Huertas Canyon. The project was funded by a $120,000 grant from the US Forest Service's Collaborative Forest Restoration Program (CFRP) to the San Antonio de las Huertas Land Grant Association. Coronado SWCD was a collaborating partner. Funds are being sought to implement the needed restoration work. Through a NM Forestry Division grant, the District worked with Placitas-area homeowners whose property borders state forest land to remove excess fuel loads near their homes in order to mitigate wildfire risk. This was a cost-sharing program in which the District and homeowners shared the costs of removing the fuel loads. Collaborating organizations included Las Placitas Association, the Earth Care Fellowship of Las Placitas Presbyterian Church, Las Huertas Community Ditch, and Firewise Placitas. This page last reviewed/updated May 5, 2017.